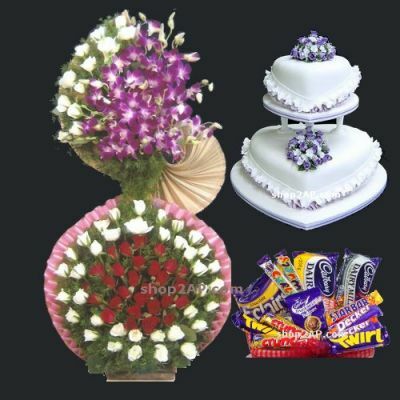 Grand Flowers - Cake - Chocolates comes with 75 Red & White Roses and 20 purple Orchids nicely arranged in a tall basket with lot of green fillers, 5KG Cakes with choice of your own Flavor, 10 Cadbury Chocolates (12to 15gms) each. A mix and match of Red and White Roses shows unity and when combined with the lovely purple orchids, they make a grand bouquet. Our florist has combined the three flowers (75 Red and White Roses and 20 Orchids) artistically in a tall basket and has also added lots of green fillers to make one of the most spectacular flowers arrangements. Send flowers online and this striking combination of red, white, purple and green is sure to take the breath away of the receiver. To the delight of your loved ones, a delicious 5 kg, two tier cake (you can choose from Butterscotch, Vanilla, Strawberry, Pineapple, Black Forest and chocolate) and 10 pieces of Cadbury’s Chocolates accompany the lovely flower basket. This is the best gift for any occasion.